Pages tagged "Dufferin Grove Park"
Canada’s first-ever public reflexology footpath is set to be built in Dufferin Grove Park this spring. The city’s Parks, Forestry and Recreation department expects to hire a contractor by April with construction scheduled for May and June and a completion date in July, according to Davenport Councillor Ana Bailao. The reflexology footpath is being built in memory of Jenna Morrison, a 38-year-old expectant mother, a yoga instructor and health practitioner, who was riding her bike on her way to pick up her five-year-old son from school when she was struck and killed by a truck at the corner of Dundas Street West and Sterling Road in November 2011. “Jenna was very active in this park. It is the park we most frequented as a family,” her partner Florian Shuck told The Villager. Designs for the footpath were unveiled at a meeting last month. The meeting was the culmination of a series of events, which included a fundraising kickoff event hosted by Morrison’s family and friends and Bailao’s Ward 18 community barbecue last fall. “I would like to thank Jenna’s family and friends as well as Parks, Forestry and Recreation staff who helped make this incredibly unique and meaningful project a reality,” said Bailao in a statement. The footpath will be situated at the south end of the park near Gladstone Avenue and Sylvan Street. This is because Shuck said he would like it to belong to the community, however, it will incorporate Morrison’s initials. The community, said Nauboris, is “excited” about a new reflexology path in Toronto. “It was important to me that we found a place in the park that wasn’t disruptive to the other programs in the park,” he said. The footpath will be 60 feet long and 20 feet wide. Inside each of the two infinity loops, there will be two separate gardens with a handrail around each loop. There will be a rock element that will stand the height of a person. “This is a very Asian thing to do,” Nauboris said. Before Nauboris and Shuck embarked on the project together, the two went for a reflexology treatment together. They relied on the expertise of a local reflexologist for advice. “In Asia, people get together in the mornings in these parks,” Nauboris said. The reflexology path captures Morrison’s spirit, Shuck said. “It relates to our life story,” he said. On a visit to Seoul, Korea in 2001, Morrison, who lived in the Dundas Street West and Sorauren Avenue area, discovered the widespread popularity of reflexology footpaths throughout Asia. Struck by this notion, Morrison dreamed of creating such a footpath in one of Toronto’s public parks. “For me, my son, it’s a landmark that will help us come to terms with acceptance and loss,” he said. The City of Toronto's Parks, Forestry and Recreation division (PFR) is opening 14 rinks tomorrow, including at Nathan Phillips Square and the new, covered rink and skating path at Greenwood Park. Residents and visitors can lace up and enjoy one of Canada's great winter activities. - scheduled public skates and shinny, including adult, all-ages, caregiver and child, child, women, and more. PFR's outdoor rinks provide a great opportunity for residents to lace up for a skate at their own pace, or they can join in a game of shinny. Check out http://www.toronto.ca/parks/skating for a list of locations, opening times and skate times. Please be safe. All children under the age of six must wear a CSA-approved hockey helmet on the ice. Helmets are also mandatory for people of all ages participating in supervised shinny hockey and learn-to-skate programs. The City's outdoor rinks are compressor cooled, which makes it possible for them to operate in a range of weather conditions. Weather and resources are the two main factors that decide when and how long the outdoor rinks can stay open. Generally, PFR needs three consecutive days of temperatures that are below five degrees Celsius to make and maintain the ice. Without weather that's cold enough, the compressors can't keep the ice frozen throughout the day creating dangerous conditions such as exposed concrete. Closures during the skating season are sometimes necessary due to unseasonably warm temperatures or following a heavy snowfall. The rinks are cared for by staff teams that circulate through the city every day. To check on ice availability after a major weather event, please call 311. The 14 rinks that open tomorrow will stay open until after the March Break. The City's other outdoor rinks will open on November 30 and remain open until February 23. Albert Campbell Square's rink will open later than the others this year because of mechanical work there. 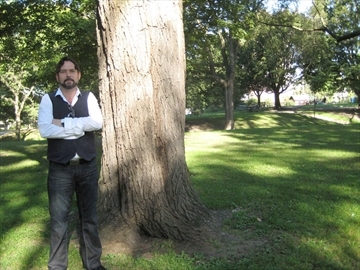 Florian Shuck stands in Dufferin Grove Park where a reflexology footpath is set to be built in memory of his partner, Jenna Morrison, the 38-year old expectant mother who was killed while riding her bike in November 2011. Florian Shuck couldn’t be more pleased with the City of Toronto’s support and enthusiasm for the creation of the reflexology footpath to be built in memory of his partner, Jenna Morrison. Morrison, a 38-year-old expectant mother, was a yoga instructor and health practitioner, who was riding her bike on her way to pick up their five-year-old son from school when she was struck and killed by a truck at the corner of Dundas and Sterling November 2011. Since then, Shuck has designed a footpath to be built in Dufferin Grove Park likely in the spring of next year. According to Davenport Councillor Ana Bailao, the footpath is officially a go and almost completely funded, she announced at her recent community barbecue. Proceeds from the event went toward the footpath as well. “Jenna was very active in this park. It is the park we most frequented as a family,” said Shuck, who explained that the location within Dufferin Grove was chosen for its flat surface, its distance from Dufferin Street and its proximity to the playground. Although the path will take a loop design, its concept does not demand a particular size. It could include benches, possibly a pavilion and a foot-washing element, but this has yet to be determined. The concrete cement walkway with different sizes of cobblestones will massage different pressure points, explained Shuck. The city is in the midst of soliciting bids from different companies and anticipates a two to three-week selection process. Collaborating with a landscape architect, Shuck says he’ll have his vision translated within a few days. “I hope that by the end of November we’ll have finalized the drawings and then have a company manufacture it in the spring. The aim is to have it implemented in the spring of next year,” he said. The reflexology path captures Morrison’s spirit, said Shuck. “For me, my son, it’s a landmark that will help us come to terms with acceptance and loss,” Shuck said. Shuck has no desire to install a memorial plaque on the path, in part because he says he’d like it to belong to the community, however, it will incorporate Morrison’s initials. While he’s not exactly sure how the path will look once completed, he knows one thing’s for sure. “My son will be the first to walk on it,” he said.